In the historical centre of Bolsena, a picturesque town situated on the shore of the lake of the same, you will find a characteristic restaurant called the "Tavernetta". In a relaxed and confortable atmosphere you will be welcomed by Mrs. Stefania and her family. Here you can chhose from a range of typical, local dishes cooked in the best traditional manner including fish from Lake Bolsena, sea fish and a variety of meats grilled. Not forgetting the gigantic pizzas for which the reustaurant is renowned.. Visit the other sections of the site to find out more about the local,staff and menu. BUON APPETITO !!! "LA TAVERNETTA", is an ancient restaurant located in the historic center of Bolsena, was founded in 1977 and since then prepares local dishes with Zero-Km ingredients. With the current family management since 1991, also produces tasty pizzas always respecting the traditions and always using the highest quality ingredients. Bolsena is full of events (religious and otherwise) of particular tourist interest, during which the country is transformed. In addition to the traditional Good Friday procession, evoking the passion of Christ, is the summer to reserve the best surprises for fans of the "parties of the country". 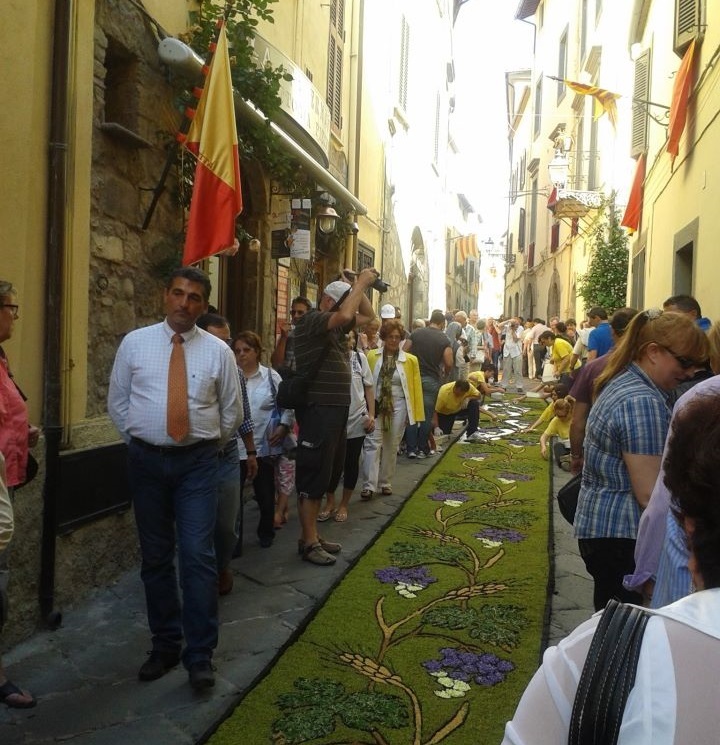 On June 18, there is the "Celebration of Corpus Christi" with features "carpets of flowers". Along with it, the Feast of Hydrangeas June 9 to 11 and the Feast of St. Anthony of June 13th, spaced waiting for the feast of the patron of the city (S. Cristina). La Festa di Santa Cristina, takes place on 23 and 24 July and commemorates the ancient representation of the mysteries of the Holy, related to his martyrdom. Finally, at the last days of August, there is the medieval festival, which will enable all present to see many themed shows. For all your questions go to Contacts page; you can find Phone number, fax and mail. You can contact us in the best way according to your needs. If you are in group send us a mail to request a quotation, we will respond quickly and in detail.